56 • RV PRO • September 2018 rv-pro.com R V M A N U F A C T U R E R S Also new to the Solitude line this year is a new lighter-colored paint package that incorporates white, champagne and tan and should prove particularly attractive to unit buyers in the South and West who are looking for something cooler than the com- pany's current dark paint schemes. Momentum Solitude isn't Grand Design's only top-of-the-line model that's looking to expand its markets. Momentum, which is rec- ognized for its elegant and practical mixing of fifth wheel living with toy hauler storage, is introducing a line of travel trailers. "That's the Momentum G Class," says Goldenberg. "Our dealers have been asking us for years now to build travel trailers and we're finally getting into it." The first three floorplans, which will be introduced at this year's Open House, are the 21 G, the 25 G and the 28 G. Each is designed to be towed by a 1/2-ton pickup, although the 21 G is expected to be light enough to be towed by a full-sized SUV. By comparison, Goldenberg says many of the company's competitors in that slice of the market require a 3/4-ton tow unit. "We're not compromising features and we're not compromising space," Goldenberg says. "The units are very well-equipped, but we now have a piece for the starter buyer who can progress into the line in fifth wheels one day if it makes sense to them." Features include bed slides, which Goldenberg notes aren't common in toy hauler trailers. Both the 25 G and the 28 G also will have living area slides and outdoor kitchens. In addition, the units will come with sizeable outdoor storage and very large awnings. How is Grand Design able to make the units lighter without skimping on construction? 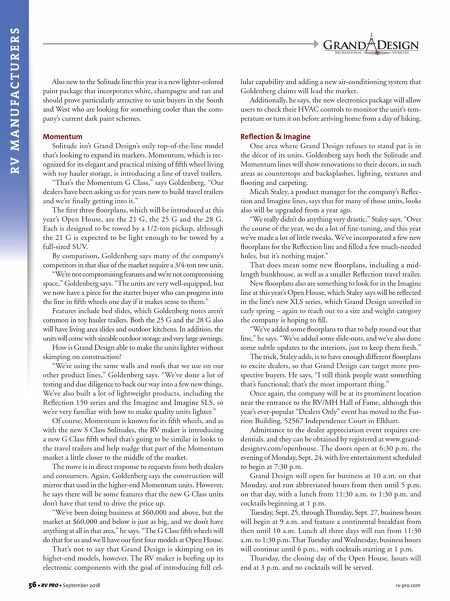 "We're using the same walls and roofs that we use on our other product lines," Goldenberg says. "We've done a lot of testing and due diligence to back our way into a few new things. We've also built a lot of lightweight products, including the Reflection 150 series and the Imagine and Imagine SLS, so we're very familiar with how to make quality units lighter." Of course, Momentum is known for its fifth wheels, and as with the new S Class Solitudes, the RV maker is introducing a new G Class fifth wheel that's going to be similar in looks to the travel trailers and help nudge that part of the Momentum market a little closer to the middle of the market. The move is in direct response to requests from both dealers and consumers. Again, Goldenberg says the construction will mirror that used in the higher-end Momentum units. However, he says there will be some features that the new G Class units don't have that tend to drive the price up. "We've been doing business at $60,000 and above, but the market at $60,000 and below is just as big, and we don't have anything at all in that area," he says. "The G Class fifth wheels will do that for us and we'll have our first four models at Open House. That's not to say that Grand Design is skimping on its higher-end models, however. 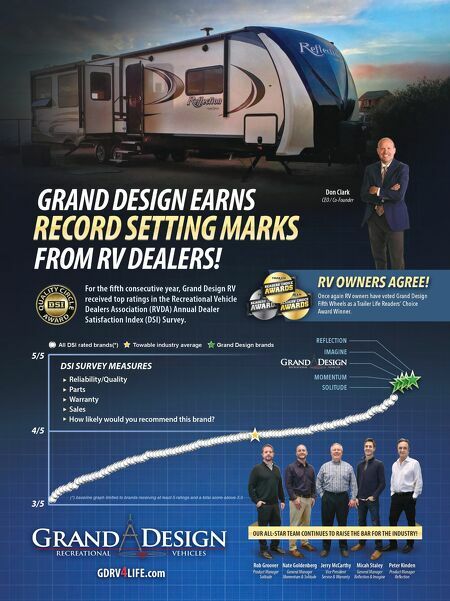 The RV maker is beefing up its electronic components with the goal of introducing full cel- lular capability and adding a new air-conditioning system that Goldenberg claims will lead the market. Additionally, he says, the new electronics package will allow users to check their HVAC controls to monitor the unit's tem- perature or turn it on before arriving home from a day of hiking. Reflection & Imagine One area where Grand Design refuses to stand pat is in the décor of its units. Goldenberg says both the Solitude and Momentum lines will show renovations to their decors, in such areas as countertops and backsplashes, lighting, textures and flooring and carpeting. Micah Staley, a product manager for the company's Reflec- tion and Imagine lines, says that for many of those units, looks also will be upgraded from a year ago. "We really didn't do anything very drastic," Staley says. "Over the course of the year, we do a lot of fine-tuning, and this year we've made a lot of little tweaks. We've incorporated a few new floorplans for the Reflection line and filled a few much-needed holes, but it's nothing major." That does mean some new floorplans, including a mid- length bunkhouse, as well as a smaller Reflection travel trailer. New floorplans also are something to look for in the Imagine line at this year's Open House, which Staley says will be reflected in the line's new XLS series, which Grand Design unveiled in early spring – again to reach out to a size and weight category the company is hoping to fill. "We've added some floorplans to that to help round out that line," he says. "We've added some slide-outs, and we've also done some subtle updates to the interiors, just to keep them fresh." The trick, Staley adds, is to have enough different floorplans to excite dealers, so that Grand Design can target more pro- spective buyers. He says, "I still think people want something that's functional; that's the most important thing." Once again, the company will be at its prominent location near the entrance to the RV/MH Hall of Fame, although this year's ever-popular "Dealers Only" event has moved to the Fur- rion Building, 52567 Independence Court in Elkhart. Admittance to the dealer appreciation event requires cre- dentials, and they can be obtained by registered at www.grand- designrv.com/openhouse. The doors open at 6:30 p.m. the evening of Monday, Sept. 24, with live entertainment scheduled to begin at 7:30 p.m. Grand Design will open for business at 10 a.m. on that Monday, and run abbreviated hours from then until 5 p.m. on that day, with a lunch from 11:30 a.m. to 1:30 p.m. and cocktails beginning at 1 p.m. Tuesday, Sept. 25, through Thursday, Sept. 27, business hours will begin at 9 a.m. and feature a continental breakfast from then until 10 a.m. Lunch all three days will run from 11:30 a.m. to 1:30 p.m. That Tuesday and Wednesday, business hours will continue until 6 p.m., with cocktails starting at 1 p.m. Thursday, the closing day of the Open House, hours will end at 3 p.m. and no cocktails will be served.